Niebaum, whose spirit of innovation and exploration continues to live on at Inglenook. Founded in 1879 by Gustave Niebaum, Inglenook remains the crown jewel of the Napa Valley under the stewardship of the Coppola family. 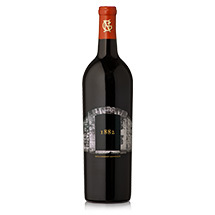 1882 was the first vintage produced by Inglenook founder Gustave Niebaum. That same year, Niebaum dug a small cave into the Mayacamas foothills on the back property of the estate in his quest for optimal barrel aging conditions. This wine pays tribute to Captain Niebaum, whose spirit of innovation and exploration continues to live on at Inglenook. A winter with average rainfall, following four years of drought, provided ample soil moisture to kick off the 2016 growing season. Early spring was warm, triggering rapid, healthy canopy growth. Average late-spring temperatures and limited rainfall reduced the risk of frost during mid-May bloom, ensuring average yields. June closed with a heat spell, slowing vine canopy growth at the ideal time. The harvest for 2016 Cabernet Sauvignon 1882 took place under optimum conditions from September 12th through October 10th. The 2016 Cabernet Sauvignon 1882 offers splendid aromas of blueberry and cassis with highlights of anise, savory fines herbes, and red cherry. Finely grained tannins enhance a complex, yet polished structure that finishes fresh and vibrant, with a mysterious hint of mocha. Blend: 84% Cabernet Sauvignon, 7% Petit Verdot, 7% Syrah and 2% Cabernet Franc.